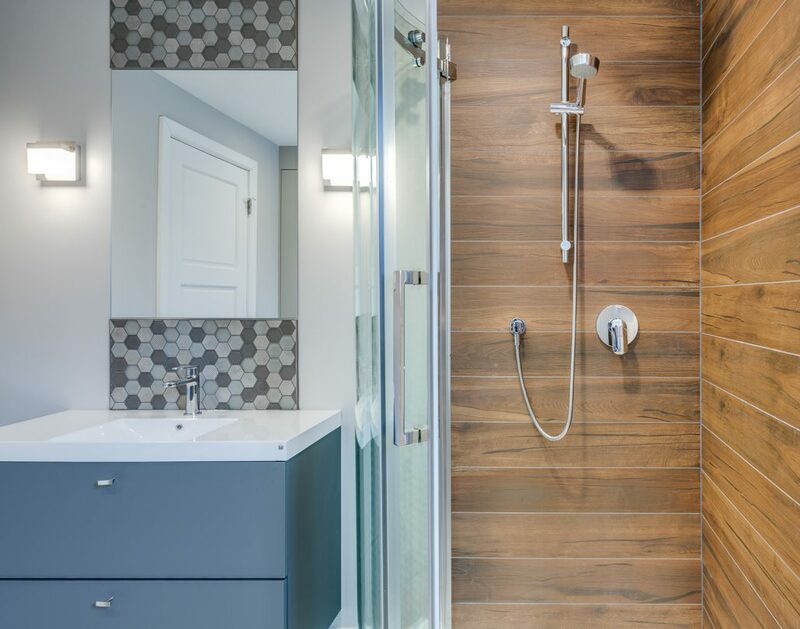 Take a look at this magnificent renovation project for two residential bathrooms on the Plateau-Mont-Royal. You too can benefit from our expertise as a general contractor specializing in bathroom renovations, in addition to our turnkey renovation services. Call us for a free consultation! These clients came to Construction Précellence with a major project: the renovation of their two bathrooms in their house in Plateau-Mont-Royal, Montreal. One of the bathrooms was on the ground floor and the other in the basement. The first bathroom required a partial demolition of the old bathroom (tearing off the floors and cabinets, replastering, etc.). We have also made changes to the electrical and plumbing systems to adequately meet the needs of our customers. With our interior designer, we opted for a more refined, more classic look, with shades of grey and white for the walls. We replaced the vinyl floor with a ceramic floor. In addition, we chose with the customer a recessed shower with sliding glass door, telephone shower head and ceramic walls. Our customers have chosen a custom vanity with two sinks and ceramic countertop and melamine cabinets with a wood finish, topped with a grey ceramic backsplash. We also installed a built-in bath with white ceramic and stainless steel faucets. 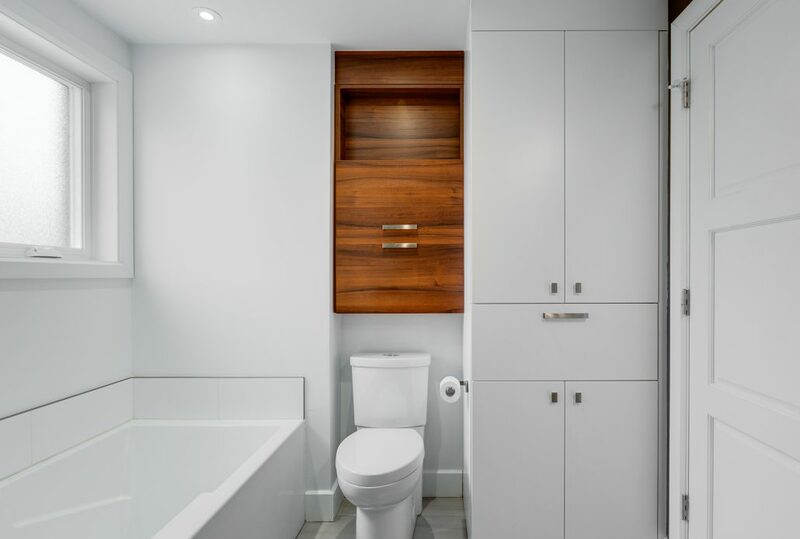 For maximum storage, the customer required custom bathroom cabinets and white melamine cabinets. For the second bathroom in the basement, the demolition work was less extensive: removal of the vinyl floor, cabinets removal, replacement of part of the plumbing, and lighting replacement. We have added a ceramic floor and a custom suspended vanity with a small ceramic backsplash. 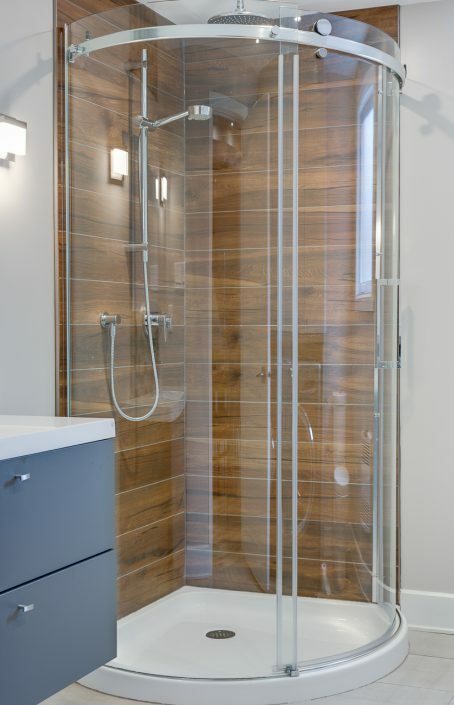 The shower is a round shower with a telephone shower head and wood finish ceramic tile. 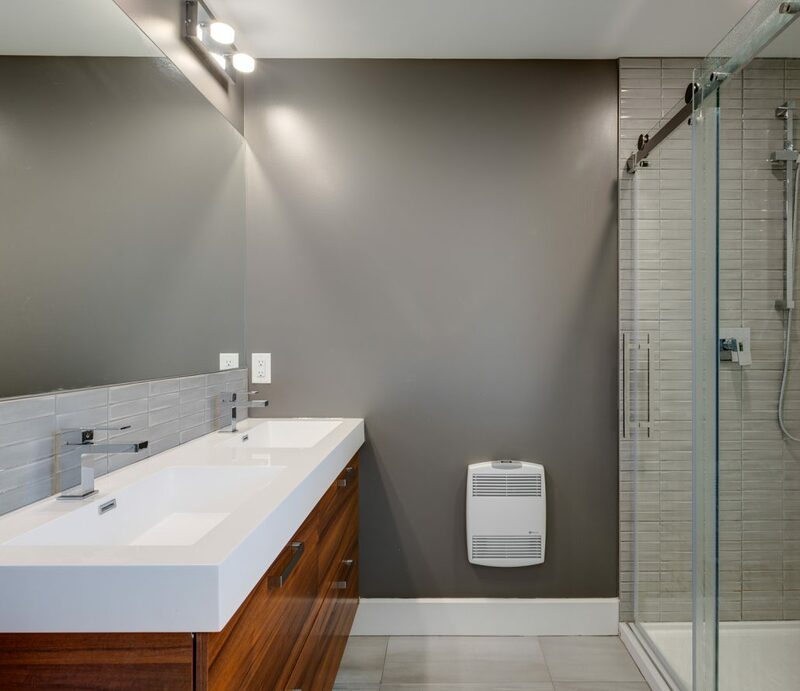 As a general contractor specializing in bathroom renovation, we will take charge of each step of your project. 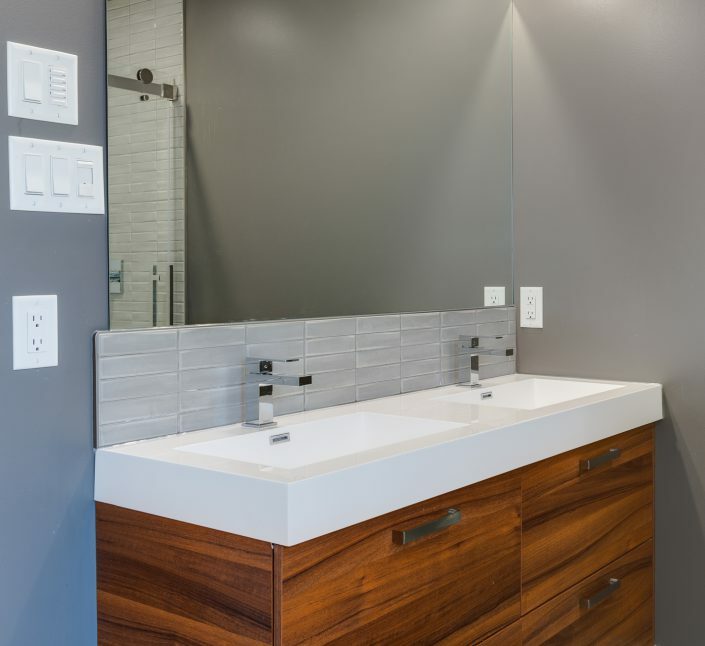 Plus, we have established long-term partnerships with electricians, plumbers, plasterers and cabinet and bathroom countertop manufacturers to offer you the bathroom of your dreams! 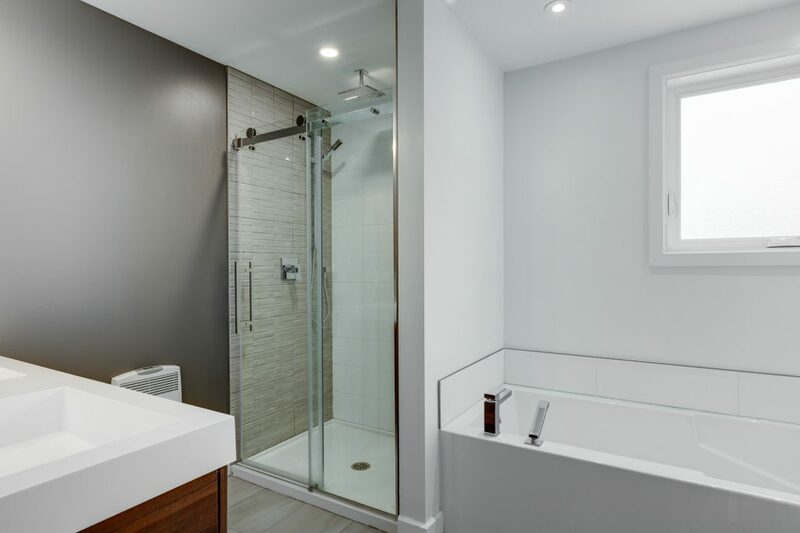 If you would like to know more about this two-bathroom renovation project on the Plateau Mont-Royal, our turnkey renovation services, our prices, or our services, we invite you to contact us by email or by phone. Your first consultation is free of charge! Our team will be happy to welcome you and answer your questions.